The No Name Keyblade, which bears the Master's all gazing Eye. The purpose of the Eye is to see events that are unraveling in the present time of the KINGDOM HEARTS Universe, and are the future for the Master's era: the KINGDOM HEARTS x era. The Black Box, as Maleficent realized, did not exist yet. But, what does this mean? This means that Luxu did something to the Box the last time he had, and since he is very obedient towards the Master's plan, then it means that, whatever he did, it was on the Master's orders. Now, when was the last time we saw the Box? Yep, in 0.2's intro: Luxu was in front of Kingdom Hearts with the Box. Now, after that, when do we see the Black Box again? Yep: after Sora closes Kingdom Hearts. It is my belief that the MoM told Luxu to throw the Box inside of Kingdom Hearts, and retrieve at a time that another Keyblade War would come to passing: which is Xehanort's war. According to Maleficent, the Black Box carries the Book of Prophecies, a book that can record and recreate worlds from the future. This is where the thing gets interesting: I think the MoM threw the Book inside Kingdom Hearts in order to record the entirety of Kingdom Hearts, and have a book counterpart to Kingdom Hearts itself. Up until now, the villains of KINGDOM HEARTS have wanted to get Kingdom Hearts in their hands. Maleficent, Ansem, Xemnas, and Master Xehanort. You know what's different to getting Kingdom Hearts? Yep: replicating it. The MoM's ultimate goal is to replicate Kingdom Hearts, and if you look at it even more, to have two Kingdom Hearts. But why? Why would he want two Kingdom Hearts? This is speculation, but I think that the MoM's end goal is to have an opposing force to Kingdom Hearts' Light: a Kingdom Hearts of Darkness. Perhaps he thinks that, if the Darkness had a Kingdom Hearts of its own, it could neutralize the Darknesss in the Universe, and that way it wouldn't crave for the light. The MoM would utilize a natural solution to a natural phenomena. Another possible explanation as to why the MoM would want to create another Kingdom Hearts is that, instead of waiting for another Keyblade War to happen, humans can have their light of Kingdom Hearts back without the need of fighting once more. Or he simply recorded Kingdom Hearts and, since KH is the collection of ALL hearts, and all hearts have chains of memories, perhaps he plans to record every single memory in existence in the book in order to have all the knowledge of the universe in the palm of his hands. And that, as they say, is that. Haha. Considering your theory is correct, why would Xigbar send Luxord and the others to search for the box? He should've known where it was and that they wouldn't find it until Kingdom Hearts appear, no? I'm still asking myself this. 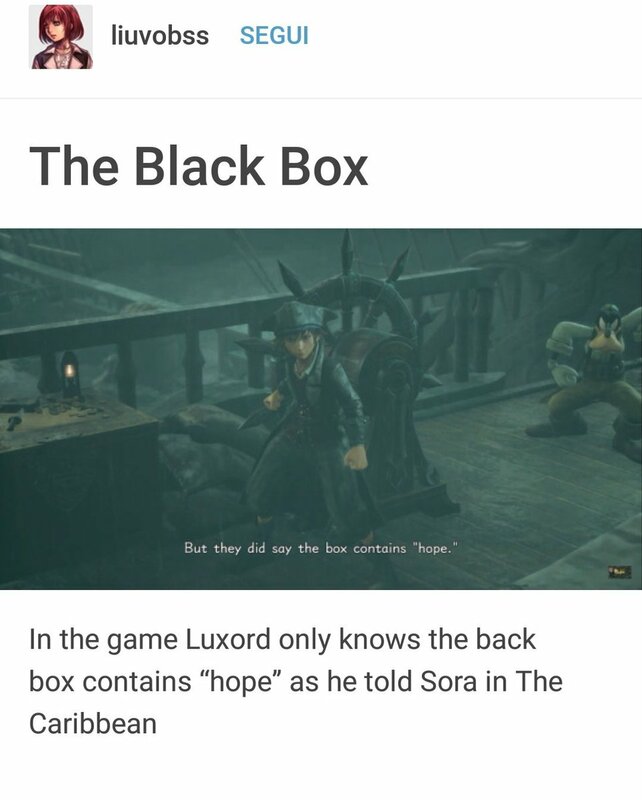 And I think it was Xemnas or Xehanort that told Luxord to look for the Box, which, in his words, "represented hope". It's obvious that Luxu knew where the Box was because the Secret Ending showed him with it. The reason as to why he would tell anyone to look for it, like Maleficent, is really challenging my thoughts. Maybe the Box reappearing works like the hearts? Where if you split the heart, like in Toy Box, you can get it to come over? Maybe Luxu planted the seed of desire with Xehanort and Maleficent in order for them to want the Box, and make it appear. Well in the cutscene where Luxord and Larxene talk about it, it isn't really mentioned who told him to look for it, only that Xigbar claims it is real. But when Luxord and Vexen convene in Pirates world, when Vexen wants to study the insides of the box (they believe it is Davy Jones' locker is the box they are looking for) Luxord is against it even after Vexen explains he wants to use it to perfect his replicas for Xemnas. Luxord even says that Xemnas has Vexen wrapped around his fingers. As for Maleficent, IIRC she believes the book of prophecy is within the box, so that's why she's hunting for it. Maybe the Master went to another Worldline in order to acquire something to do whatever he wants to do. And that is why Luxu threw the Box in Kingdom Hearts: the MoM is in another Worldline, he needed the Box, Luxu threw it, and by the time another War happened, the MoM was finished, and he threw it back at Luxu. Didn't Xemnas already create a kingdom hearts replica in II? If it wasn't a replica at least it wasn't the original kingdom hearts. I've read the theory, and though I won't say it is impossible, I think it is unlikely. First of all, why wouldn't MoM just take the box with him? Why give it to Luxu? If he could throw the box back to Luxu, why didn't he merely go back himself with the box? As you've mentioned it in the other thread of the post, it would circumvent rules of time traveling constraints, and it'd basically make it easier for MoM (and maybe others) to walk between the worldlines. This plan would seem... well a quality of life improvement for MoM, but nothing else. It would feel slightly lackbuster, that he orchestrated all this, just to make this wordline movement slightly easier for him. I think he's ultimate goal might have something to do with the fact that he too appears in Shibuya. He warned his pupils that one day he might disappear, and he did. And he appears in the same place, where Sora - who also disappeared - is now probably gone to. I think he knew, that he'd be trapped in Shibuya and he had planned and orchestrated all these things so he could return when the time comes. Now you might be onto something with portals, but I don't think that MoM had touched the box or that Luxu threw it into Kingdom Hearts (or that Kingdom Hearts would be a worldline portal). I think Luxu hid it in a way that he could only find it using No Name, or it would show itself again only if he rejoined the Keyblade (I'm thinking about a trick similar to Land of Departure -> Castle Oblivion). No. Xemnas used [I]people's[/I] hearts. The Master of Masters would literally replicate the entirety of Kingdom Hearts. Haha. Thanks for the compliment! 1. Good point of the MoM not taking the Box with him. Perhaps he wanted Luxu to do something with it before throwing it away? I don't know. I don't feel so confident of this point anymore. 2. Good point about the Worldline idea. "I believe MoM is planning to use Sora (and maybe Riku as well), to somehow force open a connection between Shibuya and the Realm of Light, so that he could use the Power of Waking and traverse back to Keyblade Graveyard through his own heart, which is inside the box maybe. This is a short version of my actual theory about MoM, but I'm still not too confident in sharing all the bits and parts. :'D"
- Okay, he'll use Sora and Riku to force open a means back into the Realm of Light, possibly triggering a Door to Light. - Why would he want to return to his past time? - If the MoM's heart is inside the Box, then what is the MoM in Shibuya? His Nobody? Could it be that he spliced his heart, placed a part of it, knew it would grew, and left it there as a means of time traveling? Sora's mom is the new villain for the next arc! Oh, the dramatic potential! lol But with Lauriam and Streritzia being related as siblings, it makes you wonder if this means that Nomura will continue to utilize family connections to deliver plot. Iâ€™ve got nothing to say, but I think the plan is so in character that it might actually be cannon and work. I think I would hesitate using Luxu/Xigbar's actions as a basis for the MoM's intentions. And what Gula says in Back Cover about the traitor having the "Sigil," I would suspect the traitor is Luxu, and thus may be going against what the MoM's intention are. I don't know how well this translates to the last few secret reports though. If he is the traitor I'm not sure why he'd be so upset about a "virus," but future Unchained X might shed more light on how Luxu, as a potential traitor, deals with it. Maybe his nature as a traitor isn't meant to come to fruition until after the second keyblade war. Even if this isn't the case, Ava directly accuses Luxu of twisting the Master's intentions. For all we know, Xigbar wasn't supposed to retrieve the box, but he's doing his own thing now. What I mean is, MoM doesn't want to return to his past time. He would return to the current timeline, but not because he wants to return here exactly, more like because this is the timeline he can return to. And yes, I do think he kind of separated a part of his heart, placed it within the box, only because then he could use the Power of Waking to return to it. Luxu is the sin for Luxuria, lust. Maybe Luxu's error is that he'll eventually lust for being the one responsible for bringing the Master, will lead to his demise and being branded a traitor. Using the Power of Waking on himself... interesting. I saw this on twitter, thoughts? 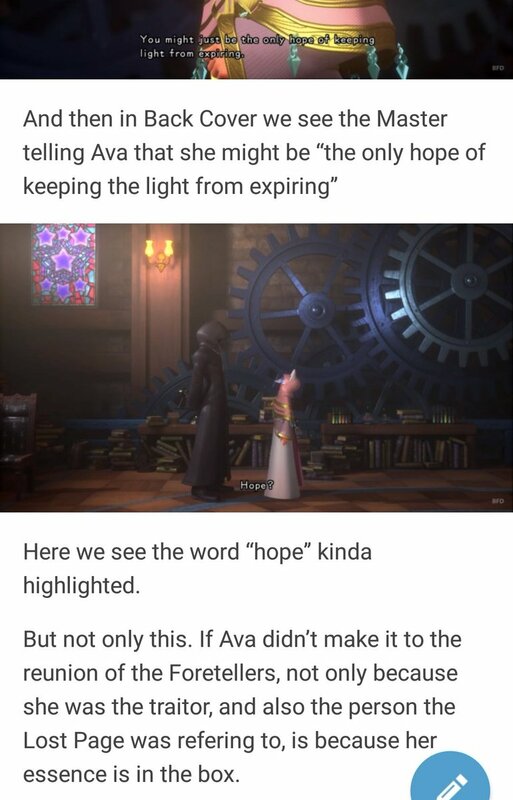 It's a possibility, but maybe by "hope" the Master meant for her to nurture a group of Keyblade wielders to go beyond the War, and said group would instigate the events that helped tip the Light in favor during Xehanort's War. 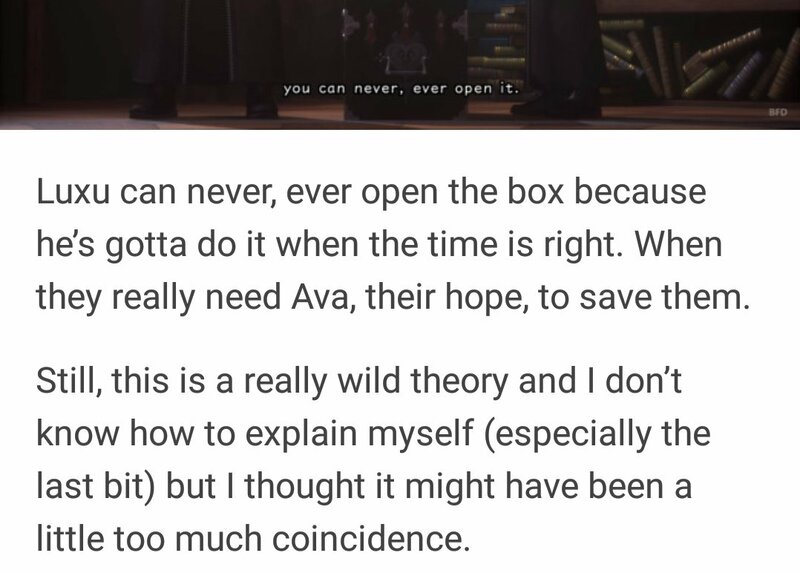 I too have been entertaining a theory for a long time now that the real Ava is in the box and has been all along. The MoM almost certainly knew the price of sending people to another worldline, and that Ava would have to pay that price in order to send the Dandelions away. 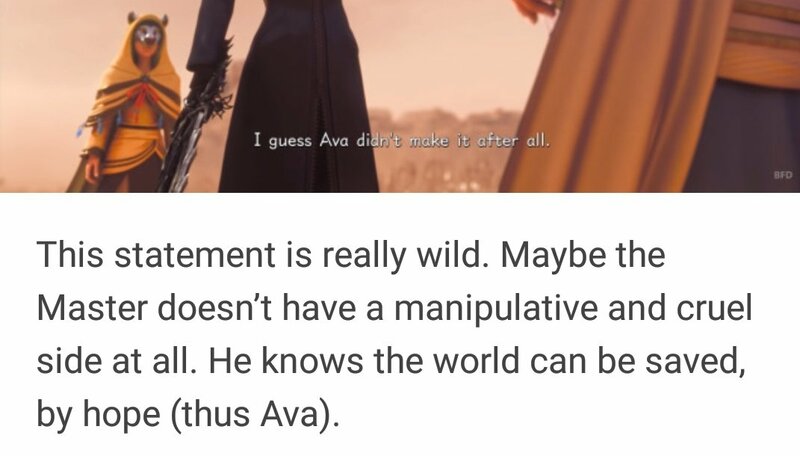 This meant that once Ava completed her role her time in the world would become limited just like Sora and perhaps also the MoM, but he still needed Ava for his own plans. So he came up with a plot, he put the real Ava to sleep and stored her inside of that box. Then he created a replica of Ava to carry out the role, and the replica Ava was completely unaware that she was a replica. That is until she talked to Luxu, he told her the truth and that's why Ava breaks down and freaks out on us, because she suddenly has it thrust upon her that she was a disposable piece created for the MoM's grand plan. In the end replica Ava completed her role, she had sent the dandelions and paid the price without knowing it until it was too late. Replica Ava vanished from the world as a result and that's why Luxigbar was not surprised to see Ava didn't show up, and how he knew her not showing up meant she carried out her role. But it goes a step further, upon realizing she was a pawn created to be used and disposed of Replica Ava no longer trusts the MoM or his plans. She seeks to disrupt them and while she's been sent away from this world she likely still exists and essentially is a loose end. The MoM and the Foretellers along with the real Ava are going to be the antagonists of the next saga going by what that chess game showed us, but replica ava is a wild card loose end who can potentially ruin things and will go against them. Replica Ava is the traitor and this is why Gula was given the role of hunting down the traitor. Because Gula and Ava are incredibly close and so the person who has the best chance of finding this loose end is Gula. That's what Luxu meant when he said the others still had to fulfill their roles. Luxu has completed his role in full he's another loose end but the MoM almost certainly still has plans for him. Ava is the hope, she's going to be the critical piece to the MoM's plans. Which I'm certain are no more "good" than Xehanort's, at his absolute best the MoM is trying to break the cycle of destruction with a new world because it seems any attempt to change this world, regardless of the worldline, it will ultimately be counterbalanced by the reality in some fashion. We stopped the keyblade war from bringing the end but it's likely we just temporarily delayed it. But he's going about that by causing two wars and uncountable amounts of sacrifices and destruction, putting his apprentices through horrors and unfair trials. No matter what his end goal, it doesn't justify the method that he's using. Just like how Xehanort wanted to build a new utopia but was going to go about doing so through horrendous atrocities accumulating in him killing everyone and everything to make way for his new world, where he would have ruled and dictated the lives of all the hearts like a god. The dandelions as well sure they stopped light from expiring but they didn't need to remain in 5 separate unions to do that, the light of the past is likely to return on the MoM's side. They were kept in separate unions because the Foretellers were always destined to return and regain control of them. Our heroes are going to have to contend with the foretellers and 5 armies of wielders, that's likely why Scala was introduced into the series as well. It's huge and the perfectly location to essentially be the MoM's TWTNW, that city will be filled again with the union wielders and the MoM + his apprentices will rule and plot from the castle. Theory Time! Theory Time! Theory Time! Theory Time! Theory Time! Theory Time! Theory Time! Theory Time! Theory Time! Theory Time! Theory Time! Theory Time! Theory Time! Theory Time! Theory Time! Theory Time! Theory Time! Theory Time! Theory Time! Theory Time! Theory Time! Theory Time! Theory Time! Theory Time! Theory Time! Theory Time! Theory Time! Theory Time! Theory Time! Theory Time! Theory Time! Theory Time! Theory Time! Theory Time! Theory Time! Theory Time! Theory Time! Theory Time! Theory Time! Theory Time! Theory Time! Theory Time! Theory Time! Theory Time! Theory Time! Theory Time! Theory Time! he put the real Ava to sleep and stored her inside of that box. This sounds like a portable Chamber of Waking. We still never got an explanation for it. The only thing we know is that it appears once you transform the Land of Departure into a labyrinth in order to protect it from outsides, and that it somehow has a connection to Scala ad Caelum, seeing as how Master Eraqus is a Blueblood, and he is tied to the Keyblade Wielders of the past/Scala. Perhaps the Box is the first iteration of the Chamber? Or maybe it was part of the stuff he witnessed through the Gazing Eye and decided to replicate? Then he created a replica of Ava to carry out the role, and the replica Ava was completely unaware that she was a replica. That is until she talked to Luxu, he told her the truth and that's why Ava breaks down and freaks out on us, because she suddenly has it thrust upon her that she was a disposable piece created for the MoM's grand plan. In the end replica Ava completed her role, she had sent the dandelions and paid the price without knowing it until it was too late. Replica Ava vanished from the world as a result and that's why Luxigbar was not surprised to see Ava didn't show up, and how he knew her not showing up meant she carried out her role. Interesting. I feel like the expansion of the Replica Program in KINGDOM HEARTS III could be a plot element to be reutilized in the future? But it goes a step further, upon realizing she was a pawn created to be used and disposed of Replica Ava no longer trusts the MoM or his plans. She seeks to disrupt them and while she's been sent away from this world she likely still exists and essentially is a loose end. So RepliAva is essentially this saga's Lingering Will? It makes you wonder how she has survived all these years. Perhaps she imitated Luxu's vessel hopping? I feel like the MoM will make a sixth Union and make Luxu its leader. Or maybe be captain of the MoM's guards. at his absolute best the MoM is trying to break the cycle of destruction with a new world because it seems any attempt to change this world, regardless of the worldline, it will ultimately be counterbalanced by the reality in some fashion. We stopped the keyblade war from bringing the end but it's likely we just temporarily delayed it. But he's going about that by causing two wars and uncountable amounts of sacrifices and destruction, putting his apprentices through horrors and unfair trials. No matter what his end goal, it doesn't justify the method that he's using. Just like how Xehanort wanted to build a new utopia but was going to go about doing so through horrendous atrocities accumulating in him killing everyone and everything to make way for his new world, where he would have ruled and dictated the lives of all the hearts like a god. Yes. I feel like Scala's introduction, and the experiment of fighting various enemies at the same time, could be a trial version of what's to come in the future: a true Keyblade War. But I wonder what his ultimate plan is? How is he going to stop the endless cycle? Is he perhaps experimenting with the Foretellers in creating a group of citizens that are loyal to his ideology? Perhaps his plan has been to nurture an entire society, empty the present world, and insert them there?